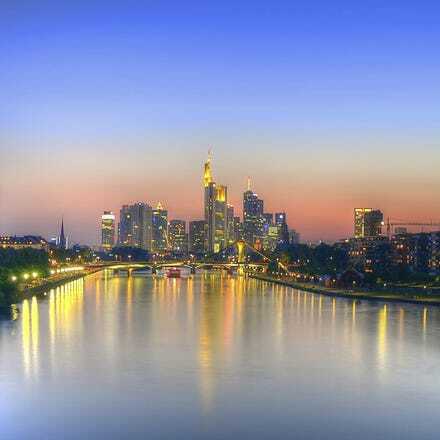 Frankfurt is Germany's 'most international' city and is a major European financial hub. Whether you are only making a short visit on business or spending more time here you will find plenty to do. Frankfurt is a great Walking City. The cast majority of its downtown destinations may be reached on foot. There is also a well-developed public Transport System, which connects Frankfurt with the surrounding Rhine-Main Region both quickly and easily. Catch a cheap flight to Frankfurt with Aer Lingus and enjoy a quick and comfortable journey. We operate daily departures to Frankfurt from Dublin Airport Terminal 2. Once you reach Frankfurt airport, the city centre is just a few minutes away. Frankfurt am Main, is a dynamic, international financial and trade fair city which boasts the most imposing skyline in Germany. This metropolitan city in the heart of Germany and Europe offers many activities of contrasting variety. Tucked in beside the skyscrapers you can find cosy Ebbelwei pubs and at the heart of the bustling city centre you can find historical sights again and again. Flughafen Frankfurt Airport is located twelve kilometres from the city centre. Aer Lingus operate from Terminal 2. It is the second largest airport in Europe. At the airport you can find both a regional train station and a long-distance train station. Local trains conveniently connect the airport with the city's main railway station. There is also a large number of buses and shuttles to get to and from the airport. You can find them outside Terminal 1 and 2. Taxis and car rental companies are represented at the airport. Frankfurt's local transport consists of commuter trains, streetcars, buses and an underground system. Tourists can purchase a ‘ Frankfurt Card’ with unlimited travel, discounts at museums and guided city tours. The card is available at visitor information centres, travel agencies, the main train station and the airport.